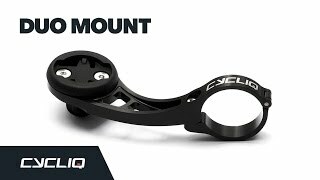 Introducing the Cycliq Duo Out Front Mount, a handy dual-purpose bike mount that attaches your bike computer and camera or light to your handlebars. The mount is compatible with 31.8mm handlebars and comes with five different bike computer caps. You can also attach any action camera or other device (i.e. bike lights) that uses the universal mounting system with the typical three fins, so you can record epic footage of your ride on the go, whilst having full helm of your bike.